"My wife and I got luck-out with the picture perfect weather throughout the 4 days. It was our first "Ways" (at 68 years of age) so we were a little apprehensive. We picked the weekend sampler. The 360 degree unobstructed scenery on top of the mountains was incredible. The route was not easy for us but we felt very safe and comfortable. The occasional hikers we met along the way were very cheerful and supportive. It was an added incentive when you know your hotel rooms and luggage were already awaiting for your arrival! Not to mention the hot shower and full breakfast. We highly recommend everyone of you to try it. Thank you to all you staff at every level before during and after the trip to make our dream vacation come true - absolutely enjoyable!" Crossing the Wicklow Mountains and finishing in Dublin city, the beautiful Wicklow Way is Ireland’s classic hiking trail. Starting in the picturesque village of Clonegal, on the Wexford-Wicklow-Carlow border, The Wicklow Way takes walkers through pretty little Irish country small towns and villages where you can experience authentic Irish hospitality. This is one of the great trails you can enjoy while hiking in Ireland. You will follow peaceful paths through ancient forests and open mountain trails to Glenmalure, Ireland’s longest glacial valley, enjoying spectacular mountain views. 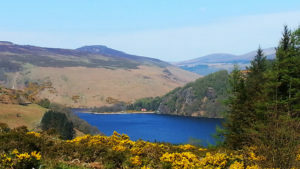 Glendalough Valley, in the heart of the Wicklow Mountains National Park, is one of the highlights of this walking tour both for its cultural importance and natural beauty. 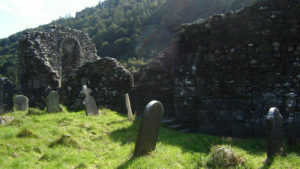 Step back in time in Glendalough with its 6th century monastic site and beautiful lakes. As the trail ascends you will be able to spot Lough Dan and Lough Tay, the lakes where popular TV series ‘Vikings’ is filmed. The walk finishes in the Victorian gardens of Marlay Park, 5km from Dublin’s lively city centre. There is something for everybody in Dublin, from festivals, markets and a lively night life to plenty of culture and heritage. Don’t miss Trinity College impressive library which houses The Book of Kells, Ireland’s most famous manuscript. Select the route and customise: start-finish points, stages in-between and options you would like to have. You can walk or cycle any of our ways. 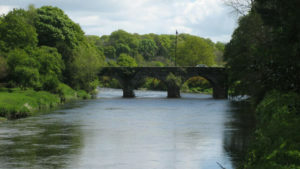 Today, you will travel to Bunclody in County Wexford were your accommodation is located in the centre of this lively market town. Bunclody is a small town with roughly 2,000 inhabitants on the Wexford-Carlow border where the rivers Slaney and Clody meet in the valley by the Blackstairs Mountains. 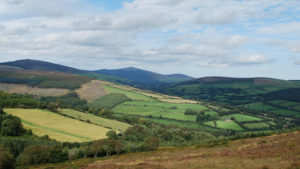 At 795m, Mount Leinster is the highest peak, standing sentinel over the valley. After a hearty breakfast you will be transferred to the start of The Wicklow Way in pretty Clonegal. For this first section of the route you will follow the Derry River walking on quiet rural roads, then moving onto mixed forest trails below the summits of Urlands Hill, Moylisha Hill and Raheenakit before reaching Stanakelly cross roads. Here you will find a hidden gem (The Dying Cow/Tallons), a cosy country pub where you can have a light refreshment or a pint of Guinness and enjoy the atmosphere while waiting for a transfer to your accommodation. This is your longest walking day but with very little height gain: a gentle way to ease you into your walking holiday. 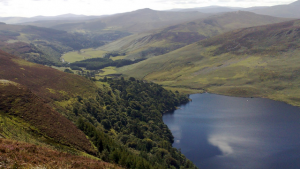 Today you have a shorter day walking The Wicklow Way, to help any achy limbs recover. From the village of Shillelagh, once again you will be walking along winding country roads (boreens), open mountain tracks with fantastic views and forest trails. 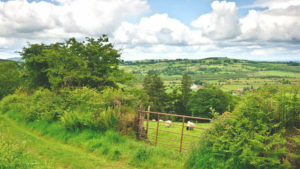 The mountain trails along Muskeagh Hill will open up awe inspiring views of this lush countryside. Just off the trail to the left between Ballybeg and Ballycumber Lane there is the remnants of an old ring fort. Best seen in the satellite view from Google maps before setting off, just so you know what to be looking out for! Today the terrain of The Wicklow Way changes and you will be walking mainly on forest paths. These can be a little more challenging especially if there has been any rainfall in the days prior to your ascent, but that is what makes todays walk all the more rewarding. As you leave Moyne you will start to gain some altitude and you will be amazed by some stunning scenery in the foothills of the Wicklow Mountains. When you walk through Ballyteige forest you will get your first proper glimpse of Lugnaquilla, the tallest mountain in Leinster. Continuing further along the trail to Carrickashane Woods you will reach a clearing with the best view of Lugnaquilla from the South Prism side (a popular area for mountaineers during the winter months as the moisture rich piety soil freezes allowing them to climb it like you would a frozen waterfall in Scotland or The Alps). Moving into the Aghavannagh valley you will enter the evergreen forest on Slieve Mann before descending into the Glenmalure valley, your picturesque home for the evening. You will wake up in the U-shaped glacial valley of Glenmalure, which at over 16km is the longest glacial valley in the UK and Ireland. Today is a short walking day, for good reasons. This will allow you to gain altitude in your own time to make the most of the spectacular scenery in the heart of the Wicklow Mountains and it will also allow you some time to explore the world renowned heritage site of Glendalough, in the heart of the Wicklow Mountains National Park and the most important stop along The Wicklow Way. This is a short and pleasant walking day. You leave the beautiful Glendalough Valley on forest trails as you skirt by the village of Laragh. You can step off The Wicklow Way here if you wish to explore this lively village with a choice of shops, restaurants and bars. 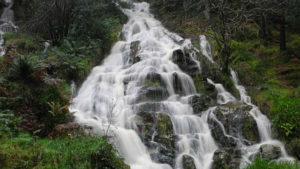 From Laragh to Roundwood you will be walking along a mixture of peaceful forest trails, mountain paths and boreens. This is a lovely section of The Wicklow Way, taking walkers across the tops of mountains with amazing views of both mountains and the coast. As you leave Old Bridge you will be ascending the ridge around Lough Dan looking down on to the location where the television series Vikings is filmed. Continuing along here you will have the perfect vantage point to view Loch Tay, a dark brown peaty lake, flanked on one side by a white sandy beach, which resembles a pint of Guinness (fittingly this area is owned by the Guinness family). From this point you will once again head North, through forest over White Hill and on to the exposed moorland of Djouce Mountain (one of Wicklows best know mountains). As you descend off Djouce you will be able to see the Powerscourt estate and its waterfall, before finishing your walk at your accommodation in the Glencree Valley. Another great day walking The Wicklow Way today over mountain tops and along forest tracks. With the city of Dublin beginning to come into view your destination is within reach. When you arrive at the Cairn (a man-made pile or stack of stones at the top of a mountain) at Two Rock, you can see the whole of Dublin City and Bay in one impressive panoramic vista. From this point it will be all downhill until you reach the beautiful Georgian estate of Marlay Park where The Wicklow Way finishes. Originally Marlay Park was a walled manor house with over 300 acres of land. It is an idyllic location for a tea or coffee before making your way into Dublin city centre. There is frequent buses to bring you into Dublin city centre from here where you will stay tonight. Consider adding an extra night accommodation if you wish to spend some time exploring the historic city of Dublin. Sample a pint after a tour of the Guinness Store House, view the magnificent book of Kells in Trinity College, be magically transported back in time when you visit the National Museum of Ireland or simply relax strolling Saint Stephens Green. There is always going on in Dublin: theatre, festivals, markets, concerts… we recommend you spend a couple of days to discover this bustling and lively city. 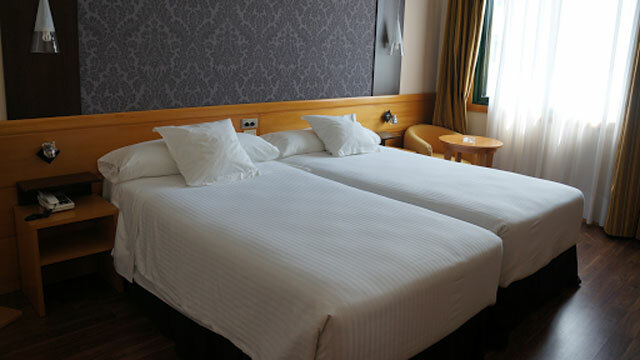 Hotels and Guesthouses have been carefully selected for their location, comfort, character, food, and the friendliness of the staff. We know you will love them. Rest assured your accommodation each day will be close as possible to your trail, so you can relax and unwind after a nice days walking stress free. Step 1: Dublin Airport to Carlow Town | Bus Éireann | Travel time 1H00, outside the main terminal, leaving every hour | Fare €23 return. Step 1: Dublin Airport to Carlow Town | JJ Kavanagh & Sons | Travel time 1H00, outside the main terminal, leaving every hour | Fare €18 return. Step 2: Carlow Town to Bunclody | Taxi | Travel time 0H30 | Fare 20 approx one way. Step 1: Dublin Airport to Dublin City Centre | Aircoach | Travel time 0H30, leaving every 15-30min | Fare €6 approx. one way. Step 1: Dublin Airport to Dublin City Centre | Dublin Bus – Bus No.747 | Travel time 0H40, leaving every 15min | Fare €6 one way. (NOTE: This bus also stops at Heuston Train Station). 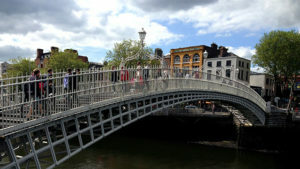 Step 2: Once on O’Connell Street it is a short walk, tram or taxi ride to Heuston Train Station or Busaras Bus Depot. Step 3: Dublin City Centre (Busaras Bus Depot) to Bunclody | Bus Éireann | Travel time 2H30, leaving 3 times a day: morning, mid day and evening | Fare €20 return. Step 2: Once on O’Connell Street it is a short walk, tram or taxi ride to Lowwe Leeson Street. Step 3: Dublin City Centre (Lower Leeson Street) to Glendalough | St Kevin’s bus | Travel time 1H30, leaving twice a day (11:15 and 18:00) | Fare €13 one way. Step 1: Marlay Park (Grange Wood, Stop 2970) to Dublin City | Dublin Bus – Bus No.16 | Travel time 0H45 from Marlay Park, departing every 30 minutes | Fare €3.05 one way. Step 2: Dublin City Centre to Dublin Airport | Aircoach | Travel time 0H30, leaving every 15-30min | Fare €6 approx. one way. Step 2: Dublin City Centre to Dublin Airport | Dublin Bus – Bus No.747 | Travel time 0H40, leaving every 15min | Fare €6 one way. (NOTE: This bus also stops at Heuston Train Station). Air Coach – Airport Transfer. Bus Eireann – Intercity Bus. JJ Kavanagh & Sons – Intercity Bus. Dublin Bus – Dublin City Bus. St Kevin Bus – Glendalough Bus. All our trips include; Holiday Pack and maps, selected accommodation with private bathroom, 24/7 support during your trip and GPS data files. You will also have the option to add or remove the Luggage transfers (one bag up to 20kg per person), bike rental and airport transfers.